Località il Piano offers you comfortable apartments in our restored farmhouse in a peaceful rural valley, surrounded by organic fruit orchards. Come enjoy the green heart of Umbria! Località il Piano is a working organic farm in the rural Valnerina, near the village of Paterno and about 25 minutes from the city of Spoleto, in the region of Umbria. The Valnerina is the magnificent green valley of the Nera River, offering spectacular scenery, beautiful stone villages and churches, rich in history. It is a candidate site for UNESCO World Heritage recognition. Many of our guests choose to rent a car and take day trips to surrounding areas including Spoleto, Cascia, Norcia, Spello, Assisi, Perugia, Orvieto and Todi. Others use public transportation, or enjoy some of the numerous local hiking trails , rafting on the Nera River or trekking with donkeys or mules. Most people enjoy just hanging out on the farm - visiting the animals, relaxing under the ancient oak trees, learning about vegetables in the garden, tasting our unusual and heritage fruit varieties, or participating in on-farm educational activities. See our contact information page for detailed directions on how to find the farm. 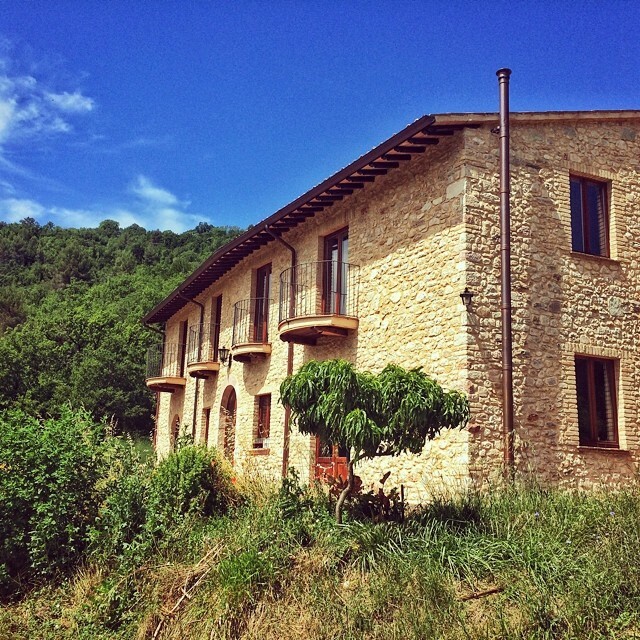 Our farmhouse has been restored with careful attention to local tradition and selection of natural materials, with antique wooden furniture, beeswax-sealed terracotta floors and huge chestnut beams. We have two apartments available for short-term rental, each offering a spacious and well-lit kitchen and 2 comfortable bedrooms. The bedrooms have queen beds with private baths and balconies. Each apartment can comfortably host 4-5 people, and the two adjacent apartments can be connected to create an accomodation for 10 (+) people. A child cot or additional bed is available upon request. Prices (valid for 2019) for the apartments range from 100-130 euros per night per apartment, with a minimum stay of 3 nights. Rates are significantly discounted for longer stays. To inquire about reservations at Località il Piano, please fill out the form below with your information and dates. We will respond shortly with a confirmation of availability and prices. Alternatively, you can telephone us at +39.338.707.5765 (mobile) or +39.0743.616300 (home, evenings).